Pompey make the trip to Glanford Park to take on Scunthorpe United as they return to League One action today (3pm). Brett Pitman is fit to face the Iron. The striker missed the Blues' Checkatrade Trophy clash against Tottenham under-21s with a knee injury last week. Pitman is back in full training after recovering from his setback. However, the former AFC Bournemouth marksman is likely to start on the bench, with Oli Hawkins set to continue leading Kenny Jacket’s attack. However, Joe Mason is set to miss the trip to Glanford Park with a groin injury. The Wolves loanee is expected to be available for Walsall’s visit to Fratton Park on Tuesday. Dion Donohue (hamstring) has been earmarked to return to fitness at the start of December. Craig MacGillivray; Nathan Thompson, Jack Whatmough, Matt Clarke, Lee Brown; Tom Naylor, Ben Thompson; Jamal Lowe, Gareth Evans, Ronan Curtis; Oli Hawkins. Substitutes: Luke McGee, Christian Burgess, Brandon Haunstrup, Ben Close, David Wheeler, Brett Pitman, Andre Green. 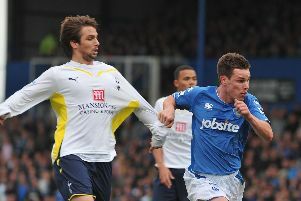 Scunthorpe are hoping to have George Thomas available for Pompey’s visit. The Welshman was included in Ryan Giggs' latest squad for their internationals against Denmark and Albania. The Leicester loanee didn’t feature in either of the Dragons’ game but could start in a left-back role against the Blues. Ryan Colclough is one who will definitely miss out. The 23-year-old was forced off with what looked to be a serious knee injury in his side’s win over Bristol Rovers last weekend. Josh Morris was expected to return to full training this week after recovering from a fractured jaw, but won’t be fit to face the League One leaders. Jak Alnwick; James Perch, Charlie Goode, Rory McArdle, Cameron Borthwick-Jackson; Andy Dales, Funso Ojo, Matthew Lund, George Thomas; Lee Novak, Ike Ogbo. Substitutes: Jonathan Flatt, Cameron Burgess, Lewis Butroid, Yasin Ben El-Mhanni, Clayton Lewis, Stephen Humphrys, Kyle Wootton.